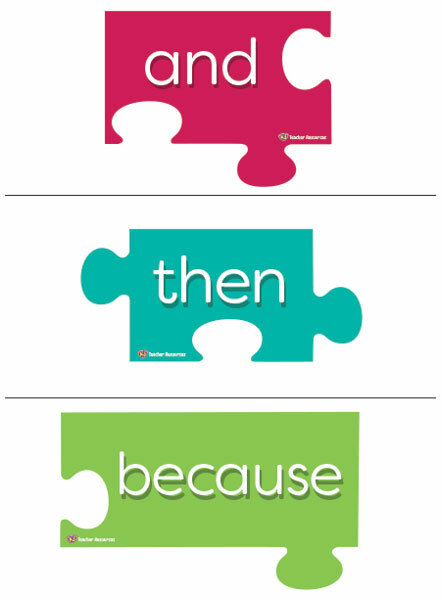 A puzzle themed set of posters to display and use in the classroom when learning about text connectives. Ideal to use as a display in the classroom when teaching text connectives. Children can use the posters as a reference when choosing which text connective to use in their writing. Print and laminate the text connective definition poster. Print, cut and laminate each text connective word puzzle piece. Use the definition poster and text connective word puzzle pieces to create a display in the classroom. Encourage the children to use a variety of text connectives in their writing. What comes next? – Invite children to add to the text connectives display by writing their own words.